Online home service directories seem to be everywhere these days. Porch. Thumbtack. Bark. Houzz. And yes, even Google Home Services. Those are just five of the creatively named (one maybe less so) home service marketplaces where contractors and service providers can connect with the homeowners who are seeking them out. Amongst the crowd though, two directories rise above all others - Angie’s List and HomeAdvisor. For a service provider, these websites are both a blessing and a burden. Each provides the promise of connecting you with new clients. But is the time and effort to monitor your presence (and the peer review systems of each site) worth it to grow your business. Or could those resources be better spent elsewhere? Let’s take a closer look at the industry leader Angie’s List, and its primary competitor, HomeAdvisor, to see if either is a fit for your company. Before we get started on the Angie’s List versus HomeAdvisor comparison, there is one disclosure that should be made known - both websites share the same owner. New York City-based InterActiveCorp or IAC oversees ANGI Homeservices, which is the parent company of both Angie’s List and HomeAdvisor. Then current owner of HomeAdvisor, IAC, acquired a stake in Angie’s List in May 2017, thus creating the ANGI Homeservices brand. It’s not an uncommon pairing considering the current climate of corporate mergers and holdings. It is, however, an important distinction since the following comparison is really about the services each one offers. Yes, these are still both lead-generation tools for your business. While each maintains separate operations and run independently of one another, understand that any monetary investment you might make with either service ultimately ends up in the same spot. Recent acquisition notwithstanding, both Angie’s List and HomeAdvisor have long histories and are the clear 1A and 1B of localized service provider directories. Each has relatively humble roots, but their principal missions have remained consistent throughout their history: provide peer-based recommendations and reviews for homeowners and lead generation for contractors. As the oldest of the service provider directories, Angie’s List has weathered all competitors to remain atop the field for over 20 years. As a startup in Columbus, Ohio, Angie Hicks went door to door to sign up consumers for the Columbus Neighbors service that reviewed home and lawn services. Once the service reached 1,000 members, it acquired Unified Neighbors and moved its headquarters to Indianapolis. Since that time, the organization expanded to include contractors, home repair and general maintenance, as well as automotive service and health care providers. At the time of its 2017 acquisition, Angie’s List was valued at over $500 million with over 5 million members and more than 50,000 professionals as part of its platform. The site has also exceeded 10 million reviews. Originally founded in 1998, HomeAdvisor started its run as ServiceMagic, a service similar to Angie’s List with a few clear distinctions. First, it offered members estimating tools to help determine the costs of home improvement projects or repairs. It also provided free membership whereas Angie’s List required paid subscriptions. In 2004, IAC acquired the brand and a little over ten years later they had $300 million in revenue, with a total user base of 30 million. The site also claimed 3 million reviews and a network close to 100,000 service professionals. For contractors, finding viable leads and connecting with future customers is a challenge. It's made even more so when the promise of future business comes with a fee structure that is unclear. While both services offer relatively straightforward membership options to the consumer - Angie's List is a freemium service, HomeAdvisor is completely free - the provider investment is less simple. It's not overly complicated, but with both sites, you could end up paying more than you planned. Between each service, Angie’s List provider fee structure is the murkier of the two. A company listing on the site is free (but is owned by Angie’s List), and if you hope to achieve any level of visibility, there are a few necessary requirements. Similar to Google Ads, if you hope to rise above the organic search, you’ll have to pay for it. The benefit is that more of your company info is visible to potential clients, but the per click ad rate is market driven and can run anywhere from $4 to $8. This cost can quickly increase. The other consideration to posting on Angie’s List is discounts - the discounts you offer to a possible new customer. These are a big player on the site due to it being one of the perks of paid membership by a homeowner (paid subscribers get access to specials, free users don’t). Again, nothing earth-shattering, but it can drive up your costs. Beyond that basic structure, there is a catch to your listing that we'll cover in the pros and cons section below. With HomeAdvisor, the pricing is more straightforward, if a bit more costly. To list your company, there is a $350 annual fee. However, as a lead-generation site, if you want to connect to possible clients directly, it can start anywhere from a $15 to $20 per lead on up to $50 or more. In some markets, the number can get as high as $80 to $100 per lead. There are instances where you are granted a refund of the lead fees if they do not result in actual work, but you might have to chase those down. It’s hard to avoid the fact that both of these websites are very much alike. Together they are the behemoths in the home service marketplace. Their extensive history and solid financial backing do not hurt either. Its little surprise they remain the preferred choice for the majority of homeowners. Both sites require a background check on their providers and offer some level of customer service when you are listed - even if the service itself leaves something to be desired (a common complaint amongst service providers). In addition, each service is well established within Google's’ organic search, which means if you type “HVAC repair near me” in Google, both Angie’s List and HomeAdvisor are at the top of the results. There are differences, however, and though each service has redemptive qualities, there are notable drawbacks worth considering before aligning with either service. 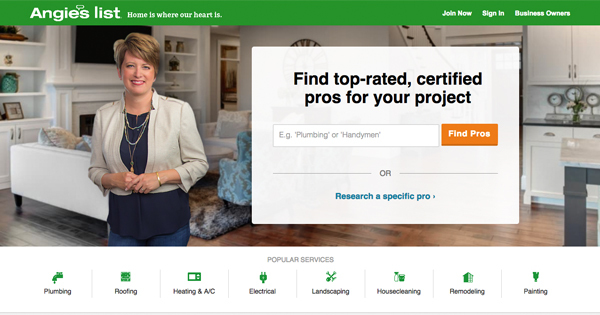 Angie’s List is by far the most widely known marketplace, and it's "from the ground up" backstory endears it to plenty of homeowners looking for maintenance or repair services. It is free to sign up, and that does provide you with a reasonable listing from which to build your site presence. However, that is where things can turn sour for a provider hoping to raise their status to "preferred." As we alluded to in the pricing section, the big gotcha with your listing is that for it to advance in the rankings, you’ll need customer reviews. Lots of them. And they all better speak highly of your services. Your visibility can rise and fall with the reviews and ratings you receive, which it should be noted you have zero control over. Of course, if you are stuck down at the bottom of the rankings, you can overcome the placement by purchasing ads. For all its popularity with homeowners, Angie’s List, from a provider standpoint, best serves Angie’s List legacy companies - those who’ve invested time and money over many years in the marketplace to strengthen their rankings, acquire a ton of positive reviews, and spend money when necessary to ensure consistent visibility. It may not have equal billing or the notoriety of its competitor, but HomeAdvisor does have a loyal base of homeowners who swear by the service. The site also presents itself as a better fit toward larger scale projects like home remodels, which means those specific contractors can more easily find a ready and willing base of new clients. Overall, the site also presents a fairer field of competition versus the Angie’s List pay to play in the big leagues model. However, the lead-bid approach can unknowingly drive up costs without any promise of actual work coming from your efforts. That bidding also means a lot of competition amongst service providers for a less than comparable volume of work. 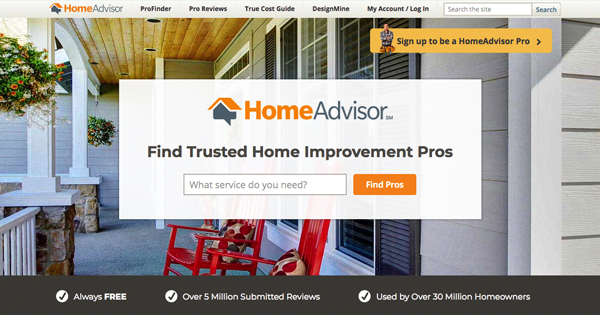 With its skew to larger projects, HomeAdvisor is not always the best site to cultivate repeat customers. Plus, as a completely free site for the homeowner, there are plenty of window shoppers with hands in their pockets and only simple estimates on their mind. With Angie’s List, you can create a free listing, have a few established clients post some positive reviews, and see what happens without spending a dime. For small startups, it could prove beneficial long term. If your business is well established without having used Angie’s List in the past, you’ll gain minimal benefit from it. Of course, if you throw tons of cash at it, you can develop a strong presence in the marketplace and do so in fairly short order. In HomeAdvisor, you get a level playing field. However, plenty of competition and an at times passive user base means you could be spending a lot of dollars and a lot of time for just a few actionable jobs. But if you're a large scale contractor or company with a few dollars and time to spare, leads can be found. So, will your business find success with either Angie’s List or HomeAdvisor? The answer is a resounding, maybe. Just don't put all of your marketing resources behind either service. Each marketplace - including the new upstarts we mentioned in the opening - should be viewed as a small part in your company’s broader marketing plan. Robust advertising that targets your specific client base, a healthy referral network and a reliable website that promotes customer engagement will do more to grow your business than anything else. That said, if you’re struggling to find new clients or want to try a new marketing avenue, each service is worth a shot as long as you read the fine print, understand their policies, and go into with reasonable expectations.